Caption slip reads: "Photographer: Snow. Date: 1955-07-10. Reporter: Sid Bernstein. Assignment: Survivors of self-propelled gun over cliff at Santa Monica Hospital. 29-30: Sgt. 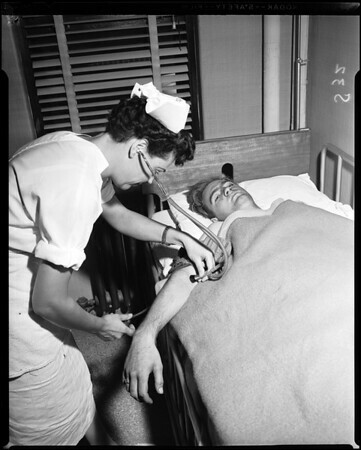 1/C Sol Sirkin on operating table for repairs from Dr. Clarence Eckvoll. At left is 1st Lt. Carl Beaty, battalion motor officer. 31-32: Pfc. Autry Lee Westmoreland Jr, has blood pressure taken by Nurse Esther Hothersall. (cq). 83-84: M/Sgt. Maurice G. La Course talks to his officers from the x-ray table."